Guard dogs are potentially dangerous animals so it's important to contact a reputable trainer for further information if you are considering training your puppy by yourself. The appearance and maligned reputation of an American Pit Bull Terrier is an advantage to any successful Pit Bull guard dog. A guard dog is a dog that is trained to attack or restrain an intruder in order to protect their family and home. Contrary to popular belief there is some controversy over whether Pit Bulls make good guard dogs. Some say that Pit Bulls are not successful guard dogs. According to Pit Bull Rescue San Diego, Pit Bulls love humans and as a result they will treat strangers as friends and not as a threat; however, Dog Breed Info Center claims that Pit Bulls make good guard dogs and they have been successful at guarding their owners property. None the less it’s important to understand that with adequate training any dog can be trained to become a guard dog, even a Pit Bull puppy. Socialize your puppy. Familiarize your puppy with strange people and strange animals as you don't want your dog to attack every strange person or animal it comes in contact with. In addition, familiarize your puppy with their environment. Give your pit bull puppy regular walks as they will help your puppy become familiar with traffic noises and other noises in the neighborhood. Lastly, your puppy should be taught to respect and interact well with other pets, other family members and children. According to The Real Pit Bull, "Pit Bulls as a breed love people, and are happy to be around them at any age, especially when they have been taught from early on that people equal "good stuff" like treats, belly rubs and toys." Socialization with pit bulls should start between 7 and 12 weeks of age. Teach your puppy basic obedience. In general, pit bulls are known to be obedient dogs once they are trained. 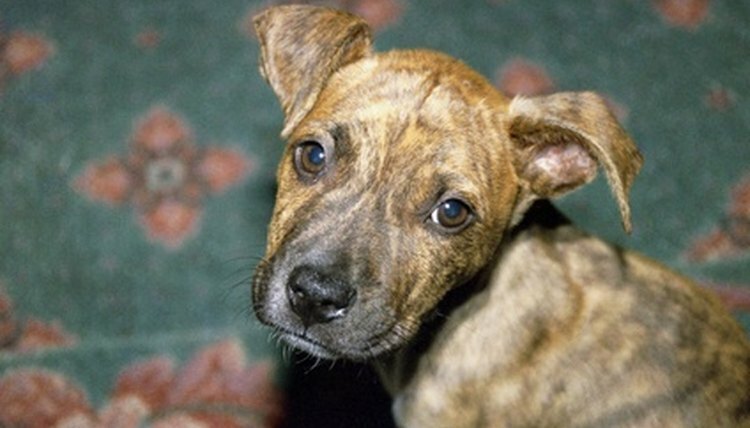 Your pit bull puppy will need to learn to obey each and every command that you give them. In order to gain your puppy's loyalty and confidence you can teach commands and reward them with treats. Once your puppy learns to obey, it can learn to attack on command. Teach your puppy not to accept commands or treats from anyone other than you. Dog Teachers.com notes, “This is very important because a guard dog is essentially rendered ineffective if an intruder is able to give the dog simple commands such as down and stay and have the dog obey while he proceeds onto the property.” In addition, accepting treats from strangers is dangerous as the dog can be bribed or distracted as the intruder invades your home. Set the rules. When training a puppy it's important that you don’t let your puppy become the alpha dog. According to Dog Breed Info, "The American Pit Bull Terrier can be willful with meek owners and needs a firm hand." Set household rules and boundaries. As a result you become the leader, and the dog learns what you teach him easier. Find a reputable training facility. For some people this works better than training your puppy by yourself as guard dog training is very serious. Pit bulls have been given a bad reputation as they have been used in dog fighting; however, pit bulls are friendly dogs. Although any dog can be a guard dog, a reputable trainer will evaluate the dog to determine if the puppy has what it takes to be a successful guard dog, such as the drive to please their owner.